Ambitious pet projects are much easier to pursue once you've already found success, but what if your initial success was with a project about pets? Lots of 'em? LOL-lots of 'em? 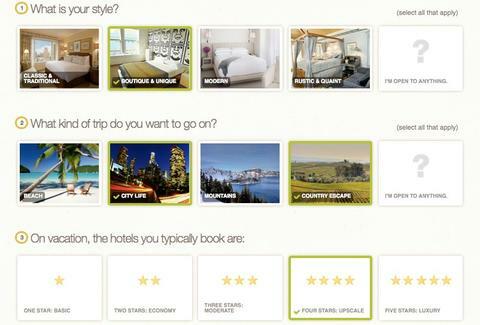 Well then you launch a site that matches people with trips & hotels they'll love, and henceforth: simplehoney. After co-founding... wait for it... I Can Has Cheezburger, the dude behind simplehoney realized he knew way more than you about what people are really into, so he created a budding site that determines your ideal home away from home, using a simple quiz to suss your "travel personality" (God help you if you turn out to be Anthony Bourdain). First, declare the locales you like (beach, city...), preferred hotel style (boutique, rustic...), and the star level you're used to, then answer seven questions, including how far in advance you typically book, and the activities you seek out; your answers'll garner you one of seven personality types, from Indiana Jones, to the Life of the Party, which definitely isn't Indiana Jones now that he hangs with Shia LaBeouf. From there, it'll recommend accommodations in an area that matches your steez (all listings're vetted by an in-house team), providing photos and a link for scoping rates and booking, functionality they plan to soon roll out on the site itself. The bad news: as they're in beta, the current listings are limited to San Francisco and Hawaii. The good news: you should take the quiz now anyway, because they'll match you with hotels all over once they roll out fully this Summer, and they'll waive the impending $100 membership fee, leaving people who missed out on the opportunity so bummed, even hilarious cats with cheeseburgers on their heads couldn't cheer them up.